0630 – Cup of Tea. BUCHAN PONY CLUB SERVICE Blue Ensign at half mast 08.30 Service at the Pony Club Venue (Rec. Reserve) -note early time 0830 – Horses proceed through designated parade and assemble in front of the Rec Hall. 0840 – Welcome by Zillah Norfolk 0843 – Special Address – History of the Australian Lighthorse – guest speaker – to be advised. 0900 – The Ode – spoken by Jeff Mc Cole. Followed by The Last Post, 1 min silence, Reveille (Flag raised to masthead by Cody Woodgate) the National Anthem. 10.55 – AVENUE OF HONOUR WREATH LAYING Welcome by Zillah Norfolk- Lay wreaths, Last Post, one minute silence, Reveille, National Anthem, finishing approx 11.05am. OLIVER JACK POULTON Oliver Jack Poulton, a 21 year old farmer, fair with blue eyes, left his home in Turner’s Flat, McLeay River New South Wales, to enlist in the army. His mother Fanny Louise and his father John signed his enlistment papers for service abroad. Oliver signed up for the duration of the war plus four months, at Kempsey New South Wales, on April 25th 1917. (Coincidentally that is now Anzac Day.) He passed his medical examination and was ‘dentally finalized’ by June 1917. He was appointed to the 6th Lighthorse on June 18 at Menangle Park, and later to B Company 25th reinforcements 4th Battalion. Private Oliver Poulton suffered pharyngitis in August and again in October, but embarked at Sydney on His Majesty’s Australian Transport ship Euripides on October 31 1917, bound for Devonport England where he disembarked on Boxing Day 1917. He marched into No 4 training camp at Sutton Veny where he was based until March 31,1918. While there, he committed the “crime” of being absent from tattoo until 10.40 pm, and for this he was given three days punishment called FP no 2. On April 1, 1918 he proceeded overseas to France from Dover to Calais. His papers say that ‘he marched in from England and proceeded to his unit’. HISTORY OF THE LIGHTHORSE Our parade this Anzac morning is led by Sergeant John Soutter of the Creswick Blue Returned Services League Light Horse Troop. This parade honours our soldiers and their courageous horses who gave their lives on the burning sands of the Middle East, and in the girth-deep mud of France and Belgium. Pioneers bred horses in the mountains, on the red gum plains of Gippsland, and on the vast stations in every state of Australia. These horses were a type from a draught-thoroughbred cross, the first of which produced a clumper. The second cross however, produced the cool head ,yet powerful frame of the Waler. Our Walers could haul guns, wagons and ambulances, and were also the chargers ridden by our Lighthorsemen. In the days of the Raj in India our horses were in strong demand. They were delivered in wooden ships by the young men who had broken and trained them. These were hazardous journeys. At home in peace time these horses were the backbone of rural Australia. World War 1 saw our Light Horse sail for the conflict with their Walers. Many took their own horses, companions of many years. In all, 169 thousand horses went overseas, and only one returned. That was ‘Sandy’, the mount of General Bridges who died from wounds suffered at Gallipoli. ‘Sandy’ lived out his life at the Army Remount Depot at Maribyrnong and was buried there. A memorial is being erected of a soldier carrying his saddle, surrounded by horseshoe-shaped gardens, with the flags of Australia, Victoria, New Zealand and the United Kingdom flying overhead. Many Buchan people including children, travelled to Broadmeadows to farewell our own boys before they sailed for the Middle East during World War 1. One of the children wrote describing the long lines of horses, and our local boys proud in their khaki uniforms and emu plumes. It was a highly emotional meeting and goodbye. The Light Horse charge as they galloped beneath the enemy guns and captured the Wells of Beersheba is unforgettable. We who ride and love our horses have a link with those who rode that day. We honour them all, especially those who paid the supreme sacrifice, and give thanks for the stamina and courage shown in our historic past by our own Australian Light Horse Regiments. 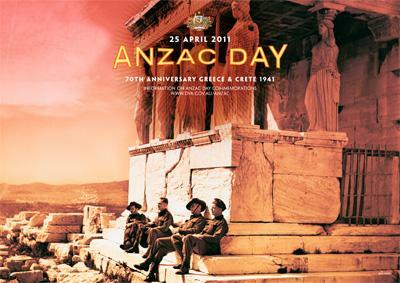 Anzac Day 2011. Clive’s address. 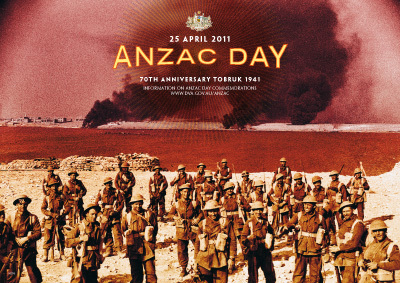 * This year has a number of anniversaries which relate to Australia’s military history, for instance it is the 70th anniversary of the siege of Tobruk and the battles for Crete and Greece during WW2. * Tobruk, which has been in the news of late for different reasons, was the scene of the first big engagements by the sons of the Anzacs, the second generation of volunteer Diggers. They became known as the Rats of Tobruk. Their commander, Lt Gen Leslie Morshead a Victorian teacher was tasked to hold Tobruk against the German army commanded by Rommel. During the 8 months of the siege the Australians lost 559 killed, 2450 wounded and 941 taken prisoner. The defence of Tobruk laid the ground work for the battle of El Alamein which is seen a turning point in WW2 which the British PM, Churchill called the “turning of the Hinge of Fate”. * 2011 is also the centenary of the foundation of the RAN and the 90th anniversary of the foundation of the RAAF. * Whilst on the subject commemorations, many will know that 2015 will be the centenary of the landing at Gallipoli. A year ago the Federal Government announced the formation of a National Commission on the Commemoration of the Anzac Centenary. It’s report and recommendations were handed to the Government the other day and a member of the Commission, Malcolm Fraser at a later news conference announced that among other things was a recommendation that war memorials, particularly in rural areas be investigated with the view to renovation/restoration where decline in populations of townships made this necessary. This year also saw the red and white mushroom Amanita muscaria, commonly known as the fly agaric or fly amanita, which is often seen in children’s books come out on Anzac Day. Can I just ask how Oliver Jack Poulton fits into the Buchan area. He was my Grandmothers cousin. I am trying to find out more details of his service. I will send this comment to our local living libraries and can get back to you. I will pass on your email for communication. Hello. I was fascinated to find the details of Oliver Jack Poulton on the Buchan website. As far as I’m aware, he had no connection with the area, so as a starter, I’d be interested to know how he came to be included in your 2011 Anzac Day Service. You’ll note that I share Oliver’s surname. My father was Oliver’s younger brother. The AWM website includes 50 plus images of documents relating to Oliver’s service and death. It happens to be 100 years since his death this coming Wednesday. Included in those documents are several letters instigated by his mother (my Nana) who was upset that the small bible he carried with him was not returned to her along with other things recovered from his body the day after the fatal clash with a German patrol out in no-man’s-land. That bible was subsequently recovered and returned to nana many years after the war. It was given to my father after her death, and he gave it to me a few years before he died. I still have it. In addition to letting me know what connection, if any, there was with Buchan, I wonder if you would mind passing my email address on to Terry Tweedie. Thanks. The reason for the connection is that one of Oliver Jack Poulton’s relatives was living here and asked if two of our residents would locate information and the site of his grave in France whilst they were there. From their research whilst they were in France one of them talked about the graves they had visited and what they had found at one of our services. I will pass on your details to Terry.